Things occurred today that annoyed me somewhat. I won't go into it here (although I did a bit of ranting on twitter earlier) and have decided instead to delve into my happy place - tiki. Just over a year ago, I started to become properly obsessed with tiki. My first post on the subject, Tiki Timewarp, mentioned a book by avid tiki collector Duke Carter. Yesterday I finally obtained my very own copy (a year and a half since I'd first heard of it) and am glad I do. Duke has quite a collection and I'm sure he's made many people jealous. His tiki room (which I suspect has extended to his entire home) is something to behold. 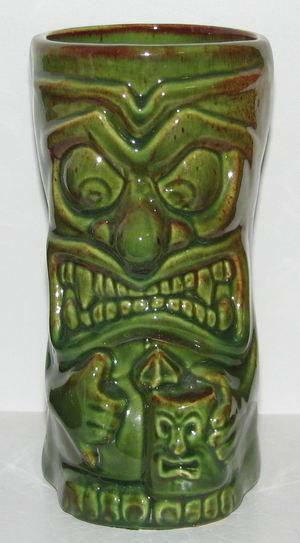 He writes that "Collecting Tiki almost becomes a Sisyphean exercise as one is convinced that 'if I only had that one Tiki...' only to be supplanted by another once that long lusted-for Tiki is found". The tiki mug I long for is 'Drinky' who CucamongaChango over on the Tiki Central Forums was lucky enough to have as his very first tiki (and kind enough to share it with me on my post). I adore that he's holding his very own tiki mug - with an umbrella in it nonetheless. As you can imagine, finding tiki in England isn't easy and although I would much prefer to discover tiki 'in the wild', I'm willing to scour other sources so that I may one day have a tiki bar that's even 1/10th as cool as the Carters'. For interested parties I also recommend 'Tiki Mugs' by Jay Strongman and 'Tiki Modern' by Sven Kirsten. I'm still trying to get my hands on a 'Book of Tiki' (hard cover preferred) which is proving difficult but is considered the Tiki Bible. Oh, and a quick shout-out to Hot Rod Tiki where I purchased 'Tiki Quest'. I was very impressed that I placed my order Monday afternoon and received the book Tuesday morning. Excellent service - recommended to any UK tikiphile (especially if you want your own copy of Tiki Quest as it seems to be the only UK stockist). I'll keep a look out for your Drinky tiki. That is one of the few things I am not collecting...I had to draw the line somewhere. I'll snag it if I see it.